What is radon? Radon is a radioactive gas that you can’t smell, taste, or see. Radon is naturally emitted from the decay of uranium in the ground. The U.S. Surgeon General has warned that radon is the second leading cause of lung cancer, next to smoking. In Utah, one in three homes may have radon levels over the suggested Environmental Protection Agency (EPA) limit of 4.0 pico curies per liter (pCi/L). In fact, in the City of Cedar Hills, one out of every two homes may have dangerous levels of radon lurking in our basements without our knowledge (radon.utah.gov). 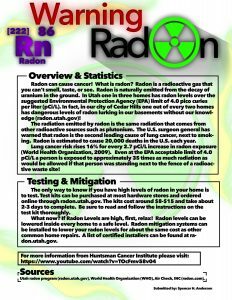 The radiation emitted by radon is the same radiation that comes from other radioactive sources such as plutonium. Radon is estimated to cause 20,000 deaths in the U.S. each year. Lung cancer risk rises 16% for every 2.7 pCi/L increase in radon exposure (World Health Organization, 2009). Even at the EPA acceptable limit of 4.0 pCi/L, a person is exposed to approximately 35 times as much radiation as would be allowed if that person was standing next to the fence of a radioactive waste site! The only way to know if you have high levels of radon in your home is to test. 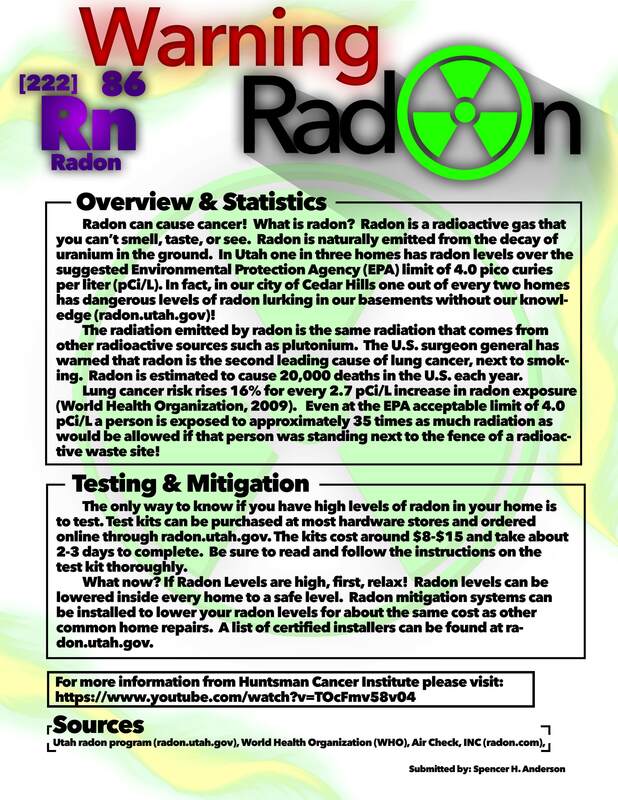 Test kits can be purchased at most hardware stores or ordered online through radon.utah.gov. The kits cost around $8-$15 and take about two to three days to complete the test. Be sure to read and follow the instructions on the test kit thoroughly. 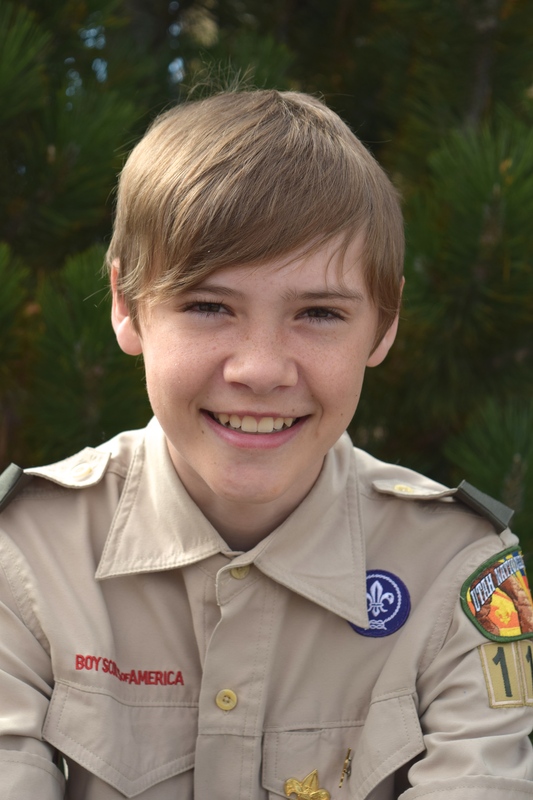 Spencer Anderson is an Eagle Scout candidate who has lived in Cedar Hills since 2002 when he was only two months old. When he started thinking about his Eagle project he decided he wanted to do something with what he likes best: graphics. Then he thought of a pamphlet or flier and started looking for things that would help others. He got the idea of a radon awareness project when he overheard his parents talking about radon and how it is a leading cause of lung cancer, second only to smoking. The Andersons had tested their home a few years before and found that their radon level was very high. They had a radon mitigation system placed in their home that had dropped the radon levels well below the danger levels that the EPA has set.